Son of Christian Joseph Jagemann, the librarian of duchess Amalia of Weimar. His sister was the mistress of the duke. The duke took care of his education with Tischbein in Kassel. In Weimar he was a pupil of Kraus and in Vienna Fügler was his teacher. He travelled to Paris and Italy to continue his studies. He portrayed many important people of his time, among them Goethe (at least four times), Nissen and Wieland. He also painted Schiller at his deathbed in 1805. He became a professor at the Fürstlichen freien Zeichenschule in Weimar. In 2004 a self portrait when down in flames during the great fire at the library in Weimar. 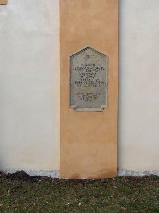 Memorial for Ferdinand Karl Christian Jagemann at the Jakobskirchhof in Weimar, where he was buried in the Cranach-crypt.